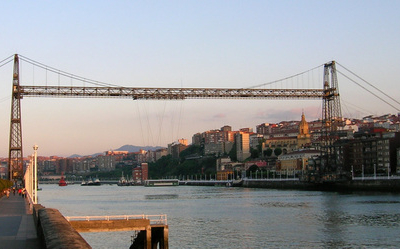 The Vizcaya Bridge (Bizkaiko Zubia in Basque, Puente de Vizcaya in Spanish), is a transporter bridge that links the towns of Portugalete and Las Arenas (part of Getxo) in the Biscay province of Spain, crossing the mouth of the Nervion River. People in the area, and even the official website, commonly call it the Puente Colgante (literally "hanging bridge", used for suspension bridge in Spanish), although its structure is quite different from a suspension bridge. It is the World's oldest transporter bridge and was built in 1893, designed by Alberto Palacio, one of Gustave Eiffel's disciples. 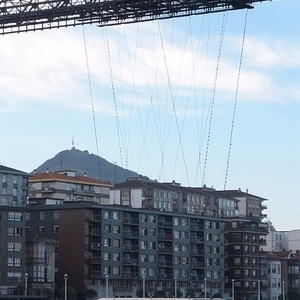 It was the solution given by the engineer to the problem of connecting the two towns without disrupting the maritime traffic of the Port of Bilbao and without having to build a massive structure with long ramps. The service was only interrupted once, for four years, during the Spanish Civil War, when the upper section was dynamited. 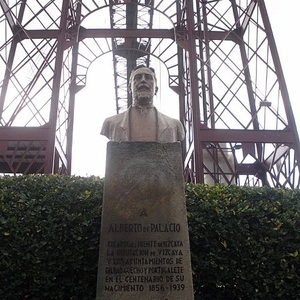 From his house in Portugalete, Palacio saw his masterwork partially destroyed just before his own death. On July 13, 2006, it was declared a World Heritage Site by UNESCO. The bridge, still in use, is 164 meters long, and its gondola can transport six cars and several dozen passengers in one and a half minutes. It operates every 8 minutes during the day (every hour at night), all year round, with different fares for day and night services, and is integrated into Bilbao's Creditrans transport system. There are two new visitor lifts installed in the 50 meter high pillars of the bridge that allow walking over the bridge's platform, from where there is a view of the port and the Abra bay. Here's the our members favorite photos of "Bridges in Bilbao". Upload your photo of Vizcaya Bridge!